Q. Should I use high sample rates? Is it worth using 96kHz or 192kHz sampling rates? Or do they just mean that my interfaces have exciting-looking numbers emblazoned on them, while I consume more disk space? SOS Forum post. SOS Technical Editor Hugh Robjohns replies: There are advocates of 192kHz (and higher) sample rates, but I don't hear any benefit, and there are good engineering arguments why such rates are actually detrimental, rather than beneficial. 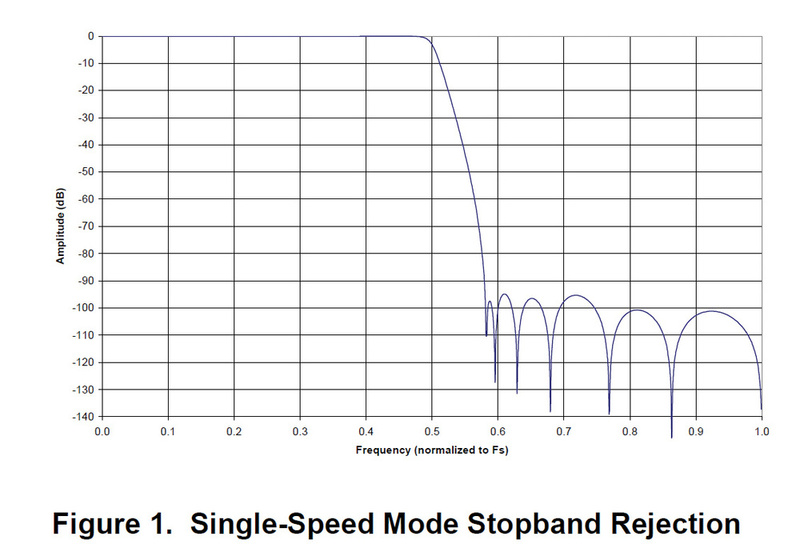 Higher sample rates only provide a greater recorded bandwidth — there is no intrinsic quality improvement across the 20Hz‑20kHz region from faster sampling rates — and, in fact, jitter becomes a much more significant problem. So I would suggest that you forget 192kHz altogether unless you need to do specialist sound‑design work where you want to slow recorded high‑frequency sounds down dramatically.The question of whether to use a 96kHz sample rate is less clear-cut, because it can prove useful in some specific situations. Yes, it creates larger files and higher Even high-performance converter chips aren't perfect. 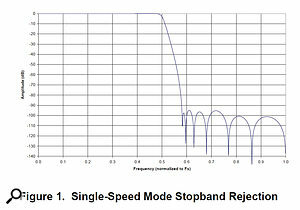 Take the Cirrus Logic CS5381 as a fairly typical example: figure 1 describes the stop band rejection or, in other words, the attenuation above the Nyquist frequency; while figure 2, a detail of the same plot, demonstrates what happens at the turnover frequency. processing loads, but it also removes the possibility of filtering artifacts in the audio band and reduces the system latency compared with lower rates. Many plug‑in effects automatically up‑sample internally to 96kHz when performing complex non‑linear processes such as the manipulation of dynamics.The filtering issue is that the digital anti‑alias filter in most A‑D converter chips doesn't actually comply with the Nyquist requirement of removing everything at or above half the sample rate. Simplifications in the filter design typically prioritise a maximally flat response to a little over 20kHz, rather than ensuring complete Nyquist compliance. The result is a filter slope which, although very steep, is often only 3dB down at the Nyquist frequency (see the two diagrams).Anything above half the sample rate that gets through the anti‑alias filter will alias back into the audio band at a lower frequency, producing anharmonic distortion which our sense of hearing can detect quite readily, even in very small amounts. However, the A‑D chip designers work on the presumption that, in general, there isn't much energy at extreme high frequencies in most recorded music, and so the aliasing artifacts will be minimal and (hopefully) inaudible to most people most of the time. And broadly, that is the case, especially with mastered material.Where the presumption falls down is in situations involving the close‑miking of sources with strong HF harmonics and noise: things like cymbals, brass and orchestral string instruments, for example. If you're working at a 44.1kHz sample rate and using capacitor microphones with a strong HF response, it's not uncommon to perceive aliasing problems which create a harsh and gritty top end, especially if the signal is peaking close to 0dBFS. This is entirely because the anti‑alias filter isn't doing quite what it should, and allowing some material to alias. Source instrument harmonics at 23kHz will appear at 21.1kHz, for example, slightly attenuated, but definitely present and very unmusical! In those kinds of conditions, shifting up to 96kHz sample rate will move the anti‑alias filter turnover far above the wanted audio band, and completely resolve the problem. (The natural roll‑off above 20kHz in most microphone designs will ensure that they do not capture significant energy anywhere near 48kHz. 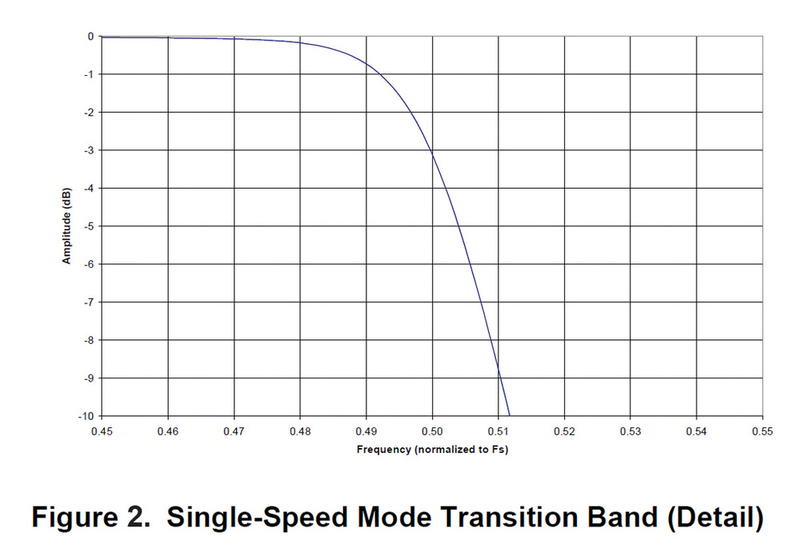 )So, for these reasons, a 96kHz sample rates can be a useful engineering option. It's also very handy if you're involved in audio restoration work, since record clicks and the like are The results of two different applications' sample-rate conversion (96kHz to 44.1kHz) compared. 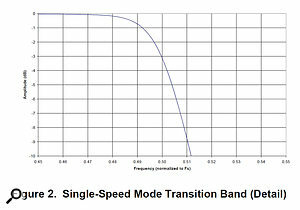 The x axis is time and the y axis frequency. The white line is the swept test signal, which continues up and out of sight to the right, all the way to 48kHz. 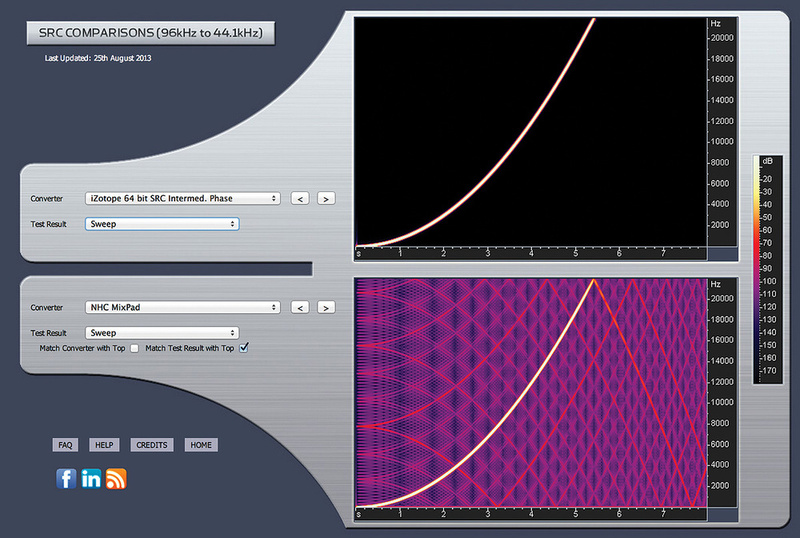 A perfect sample-rate converter should display a black background, and all else is anharmonic aliasing distortion. In other words, the tartan chart displays some major problems! easier to detect and process. But for normal applications that don't involve close‑miking trumpets with wide‑bandwidth capacitor mics, the 44.1kHz sample rate is entirely fit for purpose — as is 48kHz, for working with video. SOS Reviews Editor Matt Houghton adds: Even if you do feel the need to record at 96kHz for the reasons Hugh describes, you don't need to stick with that sample rate for mixing: it should, after all, be a lot easier to perform sample‑rate conversion offline in your DAW software. Note, though, that not all software is particularly good at sample‑rate conversion, with even some expensive and well regarded DAW software resulting in noticeable aliasing. 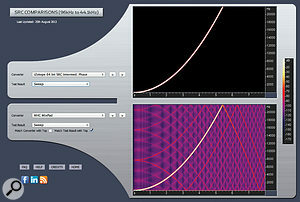 You do, of course, need to judge results subjectively, but if you're curious how well your software performs in this respect — or whether any free software performs this function any better — then check out Infinite Wave's database at (http://src.infinitewave.ca) which compares results from a huge number of applications, and includes test files so you can perform your own tests too.